At Cascade Living Group, we understand that Alzheimer’s and other types of memory loss diseases can be extremely challenging, not only to the individual who is facing the illness, but also to the entire family. We also understand that the decision to place a loved one in the care of others is perhaps one of the most difficult decisions you’ll ever have to make. 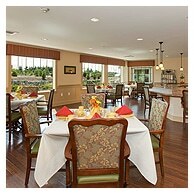 And we want you to know that Cascade Living Group is here to help in whatever way possible. Our Mosaic Memory Care Program offers residents an enriching lifestyle that helps preserve independence while offering activities and programming designed to reduce stress and confusion. We value and respect the uniqueness of each of our residents living with memory loss. We provide the personalized assistance necessary to allow our residents to achieve their highest level of functioning while maintaining personal dignity and purpose. We provide loving and supportive, secure neighborhoods where our residents – and their families – can take comfort in knowing that they are receiving the best possible care that is focused specifically on each resident’s individual needs. Our comprehensive memory care program, Mosaic, provides our residents with an enhanced lifestyle that helps them to maintain their independence and a feeling of safety and security in a comfortable environment. All of our memory care communities offer a safe, home-like environment with special amenities and life enrichment that provide memory stimulation. Additionally, every memory care community offers 24-hour licensed nursing care and a specially trained, experienced memory care team that is able to meet the specific needs of each and every resident. Definition: Mosaic is the art of creating images with small pieces of colored glass, stone or other materials. We have chosen this name because we recognize that all our lives are made up of small pieces of events and accomplishments that occur throughout a life time. They create the person our residents have become. Our neighborhoods (Adams, Baker, Cascades & Denali) are warm, cozy and home-like and provide comfort and while encouraging fond memories of favorite parts of an accomplished life. The foundation for our program lies with The Best Friend’s Approach to Dementia This concept teaches our staff members to become Best Friends with our residents. We weave this philosophy into hiring and retaining staff members as well as the life enrichment program that we offer. With our family style dining we use vintage, colorful place settings, candles, flowers and table linens. Cookies or bread baking during meal times occurs to encourage eating. Care associates sit with our residents during meals to remind them of family dinners and to assist with meal service and eating as needed. No one ‘hovers’ over the residents while they eat. Food is served at the table from platters/service dishes, rather than plated elsewhere and served. We serve 3 nutritious meals and many snacks throughout the day. We provide meaningful life enrichment activities that encourage interaction amongst residents as well as individual and self-directed activities. Monthly resident council meetings allow residents to have a ‘voice’ in discussions about events, food and other topics. Many activities are designed to gently challenge the cognitive abilities without causing stress or fear. Family support meetings are available for friends and families to meet and share the experience of having a lived one with dementia. These are great opportunities to share tips on communication, dealing with stress and handling challenging behaviors. Additionally, we have speakers available to provide educational programs about dementia, aging, medical conditions, financial planning, stress management and a variety of other pertinent topics. Our EverFit program includes physical fitness exercises tailored to the interests and abilities of all residents regardless of their physical condition. We use a combination of light resistance exercises, sitting exercises, yoga, range-of-motion-(both active and passive), dance and games, such as assorted Wii sports and games. EverWell provides 24 hour licensed nurses to manage and coordinate the health care needs of our residents. All medications are delivered by licensed nurses. These nurses are trained to recognize changes in condition and communicate these changes quickly and efficiently to physicians. (NOTE: Cascade Living is unique in providing 24 hour nursing.) The nurses are able to treat minor issues that can be managed with 1st aid. Additionally, our nurses complete on-going assessments and contribute to the development, implementation and revisions of the Customized Service Plan. This document provides Care Associates with detailed instructions for providing care based on resident’s needs and preferences.